This is a 28" 4K UHD monitor with a 3840 x 2160 resolution, 1ms GTG response time and features FreeSync for those looking to game at 4K. With its 28-inch 4K UHD display, ASUS VP28UQG gives you stunning 3840 x 2160 resolution visuals with a pixel density of 157PPI for incredible photo-realistic visuals and sharp, crisp text. The VP28UQG gives you four times the pixels of similar-sized Full HD 1080p displays so you get more detailed images when playing games or watching movies, as well as more onscreen desktop space for your various work windows. VP28UQG draws you into immersive virtual worlds, with greatly-textured elements and terrain maps that boast impressive levels of detail. Even with today's fastest games, ASUS VP28UQG eliminates smearing and motion blur thanks to a 1ms response time – the fastest in its class. This astonishing visual performance lets you react instinctively to what you see onscreen, so you can take corners like a pro race car driver, or take an enemy out with a headshot as he peeks around cover. In addition, Adaptive-Sync/FreeSync eliminates screen tearing and choppy frame rates for even more seamlessly smooth gameplay. 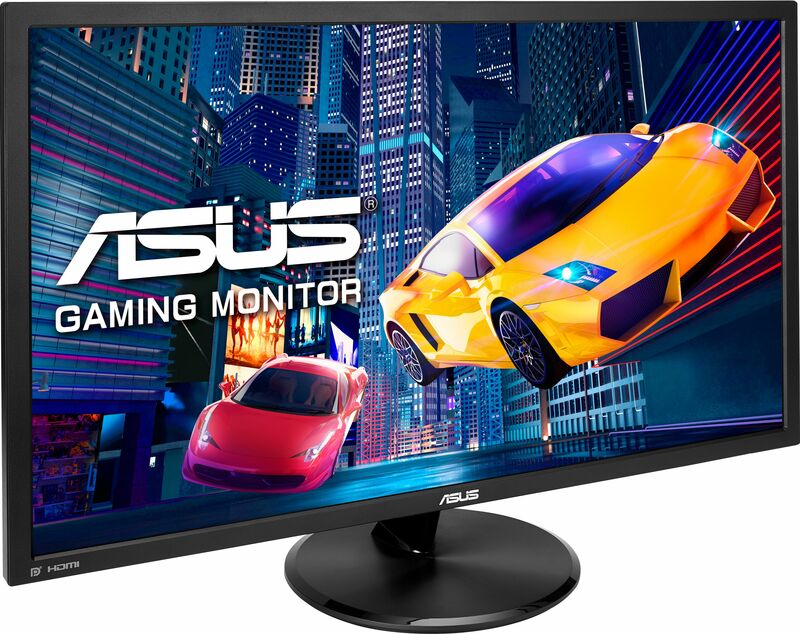 Whether you're playing games or streaming videos, ASUS VP28UQG gives you smooth 4K UHD content playback, thanks to a 60Hz refresh rate and native 4K UHD support via DisplayPort 1.2, HDMI (v 2.0). ASUS VP28UQG features the ASUS-exclusive GamePlus to give you in-game enhancements that help you get more out of your game. These tools allow gamers to practice and improve on their gaming skills. This function is co-developed with input from pro gamers, allowing them to practice and improve their gaming skills. ASUS Ultra-Low Blue Light technology reduces the amount of harmful blue light emitted by ASUS VP28UQG. You can access and select four different filter settings on screen easily through the OSD menu to find the best one that suits the task at hand. Flicker-Free technology reduces flicker to give you a comfortable gaming experience. This minimises instances of eyestrain and other potentially damaging eye ailments when you're embroiled in long, drawn-out gaming sessions.